United by seven bridges across a spectacular riverscape, Newcastle, a city on the north bank of the River Tyne and Gateshead, a town on the south bank form a single, diverse and extremely vibrant visitor destination. 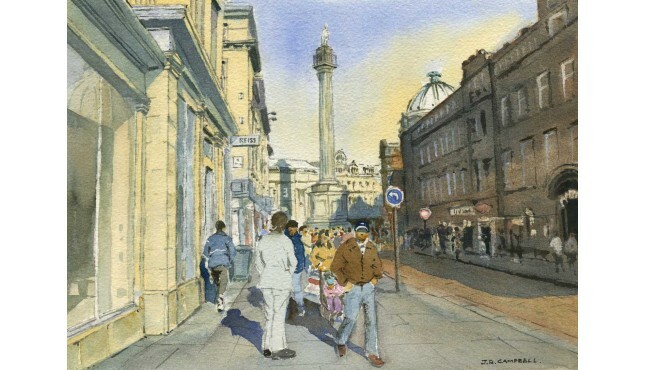 We offer what we think is the best collection of Pictures and prints of Newcastle. The historic heart of Newcastle is the Grainger Town area. Established on classical streets built by Richard Grainger, a builder and developer, between 1835 and 1842, some of Newcastle upon Tyne's finest buildings and streets lie within this area of the city centre including Grainger Market, Theatre Royal, Grey Street, Grainger Street and Clayton Street. These buildings are predominately four stories high, with vertical dormers, domes, turrets and spikes. Richard Grainger was said to 'have found Newcastle of bricks and timber and left it in stone'. [Of Grainger Town's 450 buildings, 244 are listed, of which 29 are grade I and 49 are grade II.